Museums have a long and storied place in communities around the world. From the smallest hamlet to the largest metropolitan city, museums are places where people go to understand the past, to inform their present, and to gain insight into and even influence the future. Many principles of instructional design allow museum professionals to create visitor-centric organizations, spaces, and programs that help museums become embedded within their communities as trusted places of learning. In this chapter we will address why and how a museum may use instructional design principles to understand its purpose, hone its mission, and create environments and programs that matter to their visitors. We will discuss the role of informal learning and design thinking in a museum context and will discuss museum careers that are relevant to instructional designers and how one might prepare for them. The range of museum types is as diverse as people, and each museum has, or should have, a clear purpose guided by a focused mission. Some museums are collections-based, meaning they exist to collect and care for objects, artwork, or scientific specimens, while other museums are experience-based, meaning they exist to engage visitors in some type of activity to fulfill their purpose. For example, a natural history museum’s purpose may be to collect specimens and conduct and share research on the plants, animals, and geology of a particular area. To support this purpose, this museum might have a mission to interpret ongoing research through engaging exhibits and programs that feature their collections so that visitors may gain a better understanding of the natural history of the area. On the other hand, the purpose of a children’s museum may be to promote healthy physical and cognitive development in early childhood. To support this purpose, this museum might have a mission to engage the whole child through imaginative play, storytelling, and hands-on investigations, using interactive exhibits and immersive spaces that invite children to participate in playful learning. As community needs, demographics, and/or understandings change, so must a museum’s purpose and mission. Without adapting, the museum will likely lose its relevancy, and potentially its funding. This is why principles of design thinking, are vital for a museum in developing a purpose and mission that matters to its constituents. According to research conducted by museum researchers John Falk and Lynn Dierking, only 5% of learning happens in a classroom setting, which suggests that the bulk of it happens outside of the school environment and extends over a lifetime. Informal, lifelong learning experiences include pursuing a hobby, discussions with family and friends, watching television, surfing the internet, reading, exploring the outdoors, and visits to museums and similar organizations (Falk and Dierking, 2013; see also Boileau, 2018, in this book). Museum environments are designed to promote free choice, meaningful learning. Their galleries, exhibits, and programs present multifaceted, dynamic portrayals of science, art, history, and other topics, and allow visitors significant choice and control over what and how they learn. They encourage direct and/or facilitated experiences with content, phenomena, and objects; engage visitors physically, emotionally, and cognitively; and provide opportunities to connect new information to prior knowledge and personal interests (NRC, 2000). Free choice learning in museums is powerful because, unlike school, with a set curriculum and progression, people choose to visit the institutions that hold collections or offer experiences that appeal to them personally. While in the museum, visitors can engage in exhibits and activities of their choosing, which essentially allows them to curate their own learning experiences. For this reason, museums often present differing levels or complexity of content, multiple perspectives, and personal facilitation. In this section we will discuss design thinking in a museum context. Rather than go into great detail about the history and varieties of design thinking, as was thoroughly done by Vanessa Svihla in the “Design Thinking and Agile Design” chapter of this book, we will highlight how museums are incorporating different aspects of design thinking into their practice. The use of design thinking in museums is a relatively new trend in the museum field. Traditionally, museums were established as object-oriented facilities with the role to preserve precious objects (Educational Facilities Laboratories, 1975). Museums were seen as the authoritative source of knowledge about these objects. Curators decided what was important for the museum visitors to learn. However, in the mid 1900s some museums, particularly children’s museums and science centers, made the shift to become hands-on, experience-oriented institutions (ibid.). Over time many other genres of museums also made this transition from a “look but don’t touch” approach to providing engaging learning experiences. Museums started to embrace a constructivist view of learning, which meant museum visitors could draw their own conclusions about museum objects rather than being dictated by the museum curators. More emphasis was placed on the visitor and less on the collection. To see the museum as a field of potential for human growth is to see it as a place that serves others…Its task—from this perspective—is to provide a setting that is as rich with opportunities, as alive and intriguing, as is humanly possible. The museum becomes, in a sense, a hyper-reality—a trackless realm to play in . . . that offers opportunity for engagement in multiple ways, with the capacity to be intense and powerful (p. 110). 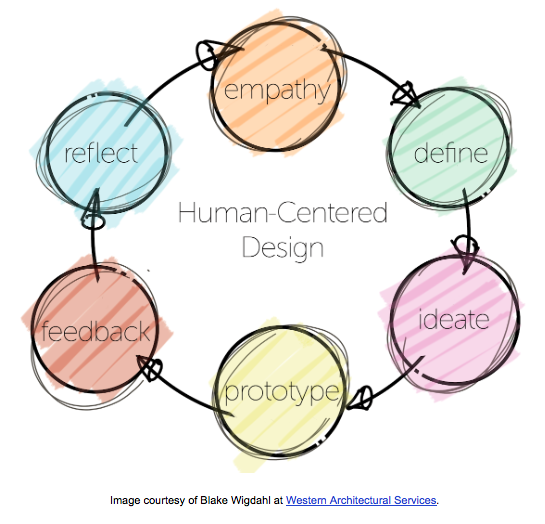 With this in mind, human-centered design, and design thinking in general, has naturally become an increasingly important and effective tool for museum professionals. What Does Design Thinking Look Like in Museums? In this section we will briefly discuss the use of design teams in a museum setting and then will detail a specific design case in the building of the Museum of Natural Curiosity at Thanksgiving Point in Lehi, Utah. To successfully lead or participate on a museum design team, an instructional designer will need to understand the role of each of these departments. Similar to an instructional designer who works at a computer company and has to “speak the language” of the software developers, testers, graphic designers, etc., an instructional designer on a museum design team needs to “speak the language” of the various departments. It is not expected that an instructional designer be a content expert on the project being considered; rather, an instructional designer is a facilitator of the design process. The Thanksgiving Point design team learned from visitor feedback—through surveys, observations, and informal interviews—that the visitors wanted to have a children’s museum built at Thanksgiving Point. After deciding to move forward with the decision to build one, the design team, along with board members and senior managers, visited some of the most reputable children’s museums and science centers throughout the United States. Our purpose was to gather ideas and best practices and to understand how these museums were meeting their visitors’ needs. Originally, we intended to build a children’s museum. However, we realized we wanted a museum that was focused on the entire family, as families were our primary audience at Thanksgiving Point, rather than just children. Also, when we visited science museums around the country, we realized we wanted to have elements of hands-on science centers as well. The Museum of Natural Curiosity was then defined as a family museum. It was to be a hybrid of a children’s museum and science center. Defining this clearly gave us specific direction as we moved forward with the design of the museum. The Thanksgiving Point design team ideated many times throughout the process of designing the experience for the Museum of Natural Curiosity. Thanksgiving Point also contracted with an outside design firm to help develop ideas and fabricate the exhibits. The design team and outside design firm held many brainstorming activities together and at times included other key stakeholders, including visiting families and board members. As ideas were generated, favorite ideas rose to the top, and then those ideas went through additional stretches of ideation. In a way, each exhibit idea went through its own design process. Because Thanksgiving Point is a multi-museum complex, we already had a museum with space for testing our ideas. The Thanksgiving Point exhibits team developed a prototyping space in a traveling exhibit gallery that they called the Try It! Lab. The lab was a design space behind a plexiglass wall. When the exhibit developers wanted to try out a new idea, they would build a mockup of the idea, take it out to visiting guests on the other side of the plexiglass, and get their feedback on it. The prototype was enhanced or adjusted to incorporate the feedback from the guests. All of the exhibits in the Museum of Natural Curiosity went through an extensive amount of prototyping. The Thanksgiving Point design team used the Audience Research and Evaluation Team to help measure guest feedback throughout the entire process. They helped measure guest feedback on the exhibits and programs. Additionally, before the museum was opened to the public, there were three months set aside for testing. During these three months, many outside groups, including schools, special needs groups, and families were invited to attend. The entire three months was spent getting their feedback and incorporating it to improve the overall experience. The Thanksgiving Point design team reflected often on the process and project throughout the design process. It was helpful to regularly check our progress toward accomplishing our goals. Additionally, we have reflected on the design of the Museum of the Natural Curiosity as we have designed additional exhibits and experiences. The design team is now designing for Thanksgiving Point’s fifth and newest venue, the Butterfly Biosphere. The team is reflecting on and taking lessons from the Museum of Natural Curiosity experience to help ensure the Butterfly Biosphere also meets the needs of visiting guests. Careers in museums are as varied as museums themselves, and the study of learning and instructional design is a great preparation for many museum jobs. If you land work in a small museum, be prepared to wear multiple hats! In a larger museum, your work may be more specialized, but collaboration with other departments will be important for cohesive and effective learning experiences for your visitors. Below are some common positions in museums that practice learning and instructional design in their work. Many of the descriptions include real-word perspectives on the work in call-out boxes labelled “From the Field.” These quotes come from anonymous responses to a survey we distributed to practitioners in January, 2018. Museum educators design, develop, and deliver programs that enhance a visit to the museum for visitors of all ages. Programs may take the form of guided tours, facilitated gallery activities, lecture series, outreach materials for classroom teachers, digital applications, summer camps, maker spaces, and more. Educators play an important role on exhibit teams to strengthen the educational soundness of an exhibit. They work with curators/content experts to ensure the accuracy of educational programs. While there are no report cards, tests, or required curriculum, don’t think this isn’t serious work! It is important for a museum educator to systematically apply an understanding of development stages, learning theory, learning objectives and outcomes, and learner-centered design to the experiences they create. Organizational, budgeting, and “people” skills are also vital. As informal learning environments, we don’t give our visitors tests as they leave the museum, so how do we know visitors are learning from the exhibits and programs we design? This is the role of museum evaluators. Evaluators work with designers and educators to explore the effectiveness of their exhibits and programs. In addition to surveys and interviews, museum evaluators use prototype testing, observations, and a variety of other creative methods to explore how the museum is meeting its goals. Researchers take on the additional responsibility to study the nature of learning in museums to add to the body of knowledge that helps us optimize what we do in them. Museum evaluators should have competency in both quantitative and qualitative research methods, data analysis, evaluation planning, and research ethics. It’s also helpful to be familiar with the process of design and the role of evaluation within that process. Exhibit designers craft compelling stories to share with museum visitors. Working with curators, content experts, and other museum staff, exhibit designers select topics, develop concept plans, write labels and interpretive text, and build and install components – both physical and digital. You might think of museum exhibitions as a kind asynchronous learning – with the exhibit designer being the instructor, the museum visitor the learner, and the exhibit as the medium. With this in mind, learner-centered design thinking, conceptual planning, spatial planning, project management, and storytelling are all important skills in this job. While not traditionally taught in instructional design class settings, physical construction and design skills such as technical drawing, material building, woodworking, and other basic carpentry skills are also marketable skills for an exhibit designer. Depending on the size of the museum, the leadership team may include an executive director, senior management, the board of directors, grant administrators, development directors, and others who set the vision and evaluate opportunities through the filter of the museum purpose and mission. A museum’s leadership team oversees all aspects of the visitor experience by managing the staff that works to offer unique experiences for visitors every day. This may even include overall venue design and construction! An instructional designer in a leadership position will help set the overall goals of the museum. The mission he or she helps draft will greatly determine the trajectory of learning that occurs within the museum. In these leadership positions, management and budgeting skills, along with the ability to think long-term, are especially important. As non-profit organizations, many museums hire consultants and contractors on a project by project basis to save the cost of a permanent employee or when the scope/nature of the project is fixed. This work may be in any of the above areas and allows you the flexibility that comes with self-employment. Generally there are not entry-level positions as a contractor. You will likely need extensive experience in your chosen field for credibility. For any museum job, a great place to start is volunteering and internships. Find a museum or museum professional whose work interests you and reach out. Take the initiative to offer your time, ask questions, and expand your network. Be prepared to get this initial experience (even internships) without being paid – remember that non-profit status? But the sacrifice will pay off – most museum professionals really enjoy what they do! There are other things you can do in grad school to prepare for a museum career. Consider taking classes about informal education or the principles of learning. Museums will be interested in hiring people that have previous, practical experience with design projects, research, and evaluation. If you are interested in going into museum management, taking financial and other business strategy classes will also be very helpful. Museums value employees that can think independently but can also work well on a team. You will find that museums are generally very open to working with and sharing their ideas with others, including college students. It is not uncommon for museum professionals in one museum to ask museum professionals from other museums for ideas on increasing revenue, increasing visitor satisfaction, improving exhibits and educational programming, etc. The museum field is very collaborative. Lastly, attending one of the professional associations listed below will provide you with some great exposure to the museum field. Many of the associations listed below offer student scholarships for free registration, travel, and lodging. There are several museum-related professional associations, each with their own informative websites (great places to check out museum job listings), listservs, peer-reviewed journals, and conferences. For starters, explore these, but also search for state and regional museum associations for opportunities close to home. American Alliance of Museums (aam-us.org [https://www.aam-us.org/]). Established in 1906, AAM represents more than 35,000 individual museum professionals, volunteers, and institutions. They help to develop standards and best practices, gather and share knowledge, and provide advocacy on issues of concern to the entire museum community. Association of Children’s Museums (childrensmuseums.org [http://childrensmuseums.org/]). Started in 1962, and with more than 400 members in 48 states and 20 countries, ACM seeks to leverage the collective knowledge of children’s museums through convening, sharing, and dissemination. Association of Science-Technology Centers (astc.org [http://www.astc.org/]). ASTC is a global organization for science centers, museums, and related institutions. ASTC strives to increase awareness of the valuable contributions its members make to their communities and the field of informal STEM learning. Founded in 1973, ASTC represents over 600 members, including science centers and museums, nature centers, aquariums, planetariums, zoos, botanical gardens, and natural history and children’s museums, as well as companies, consultants, and other organizations that share an interest in informal science education. Visitor Studies Association (visitorstudies.org [http://www.visitorstudies.org/]). VSA is dedicated to understanding and enhancing learning experiences in informal settings through research, evaluation, and dialogue. Museum Education Roundtable (museumedu.org). Museum Education Roundtable provides scholarship and professional learning for museum educators. There are several relevant, peer-reviewed journals and other publications we would recommend to those that are new to the museum field. The following list is not comprehensive, but it at least gives a starting point for those who want to know what topics are being discussed in the field. This list includes both research-based and practitioner-based publications. Curator: The Museum Journal (curatorjournal.org [https://curatorjournal.org/]). Curator is a research-based, peer-reviewed journal intended for museum professionals, researchers, and students that focuses on general and urgent issues that museums face. Journal of Museum Education (museumedu.org [http://www.museumedu.org/]). The Journal of Museum Education is a peer-reviewed journal that focuses on issues and ideas related to museum education. It is intended for museum, research, and education professionals. Topics include learning theory, visitor research and evaluation, strategies, and responsibilities of museums as public institutions. Visitor Studies Journal (visitorstudies.org/journal-and-archive [https://edtechbooks.org/-XNB]). Visitor Studies Journal is a research-based, peer-reviewed journal published by the Visitor Studies Association that focuses on issues related to visitor research and evaluation. The journal publishes theoretical ideas and practical solutions and is intended for both researchers and practitioners. Museums & Social Issues: A Journal of Reflective Discourse (tandfonline.com/toc/ymsi20/current [https://edtechbooks.org/-Qo]). Museums & Social Issues is a peer-reviewed journal that focuses on the way museums respond to, become engaged with, or highlight social issues. Topics include race, immigration, religion, gender equality, and other contemporary issues. Museum Magazine (aam-us.org/programs/museum-magazine [https://edtechbooks.org/-Js]). Museum is published by the American Alliance of Museums. This practitioner-based publication addresses general issues that museums face today. Dimensions (astc.org/publications/dimensions [https://edtechbooks.org/-JHe]). Dimensions is a magazine published by the Association of Science-Technology Centers. This practitioner-based publication addresses issues and discusses solutions relevant to science and technology centers. Hand to Hand (childrensmuseums.org/members/publications [https://edtechbooks.org/-AD]). Hand to Hand is an editor-reviewed journal published by the Association of Children’s Museums. This publication includes articles and discussions related to major trends in the children’s museum field and also features interviews with children’s museum professionals. Many principles of instructional design, when applied in a museum context, can help museum professionals create venues, exhibits, programs, and experiences that are informed by and reflect the needs of their visitors. The museum field offers a wide range of fulfilling careers for those interested in applying aspects of instructional design to these diverse, public-serving institutions. The museum field is in constant need of bright, committed individuals who are passionate about improving the museum experience. Those with a background in instructional design have the ability to make unique contributions in many museum professions, including exhibit design, education, research and evaluation, and administration, thus influencing the overall experience for visitors. In turn, the museums can have a lasting impact on the patrons who visit them. Educational Facilities Laboratories. (1975). Hands-on museums: Partners in learning: A report from educational facilities laboratories. . New York, NY: Educational Facilities Laboratories. Falk, J. H., & Dierking, L. D. (2013). The Museum Experience Revisited. New York, NY: Routledge. Humphrey, T., & Gutwill, J. P. (2005). Fostering active prolonged engagement: The art of creating APE exhibits. Walnut Creek, CA: Left Coast Press, Inc.
Pekarik, A. J. (2010). From knowing to not knowing: Moving beyond “Outcomes”. Curator, 53(1), 105-115. Stephen Ashton, Ph.D., has been the Director of Audience Research and Development at Thanksgiving Point since 2012, where he has been responsible for leading all the audience research and evaluation efforts for Thanksgiving Point. Stephen’s areas of expertise include audience research, evaluation, measuring impact, instructional design, design thinking, and informal learning. Stephen has a masters and doctorate in instructional psychology and technology from Brigham Young University. In 2015 he was awarded the Rising Professional Award from the Utah Museums Association. 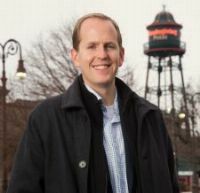 He currently serves on the Utah Museums Association Board, Thanksgiving Point Board of Directors, and as a trustee of the Ashton Family Foundation. 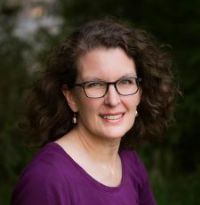 Kari Ross Nelson received a MA in Museum Studies from San Francisco State University and, after a decade of work as a museum educator, a MS in Instructional Psychology and Technology from Brigham Young University. She works as a Research and Evaluation Associate at Thanksgiving Point Institute, a mentor to students studying museum practices at BYU, and a consultant for museums and other cultural organizations in Utah. Lorie Millward is the Vice President of Design and Programming at Thanksgiving Point Institute in Lehi, Utah. She oversees the design, development, and construction of all venues, exhibitions, programming, and evaluation at Thanksgiving Point including: The Museum of Natural Curiosity; Ashton Gardens; The Museum of Ancient Life; Farm Country; and Butterfly Biosphere. She has championed informal education, inclusion, and human-centered design throughout her nearly 30 years in the field. 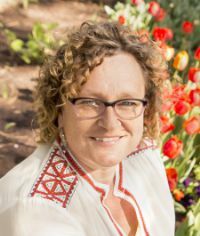 Lorie currently serves as the President of the Utah Museums Association Board of Directors, on the Western Museum Association Board of Directors, The American Alliance of Museums Diversity Committee, and the Utah Education Association Partnership Board.